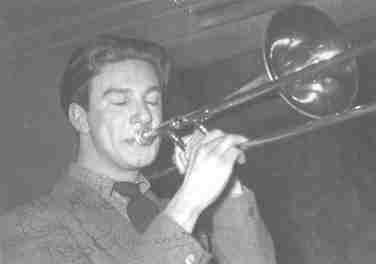 Trombonist Roy Crimmins was born in London on the 2nd August 1929, although his parents had originally come from Ireland - with strong Irish blood in his veins he likes to say that he grew up in 'County Kilburn'. He turned professional by joining the Mick Mulligan band in 1952. 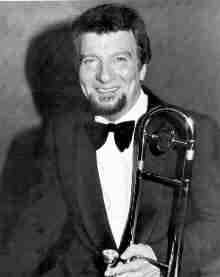 Of Irish and Scottish descent, he was self-taught, but later took lessons from the American bass trombonist with the Philarmonia Orchestra, Ray Premru, and the then Ted Heath principal trombonist, Don Lusher. Archie Semple joined the Mulligan band in 1953 and became firm friends with Roy. The same year they both left and joined Freddy Randall's band. Alex Welsh came to London from Edinburgh to form a band and Roy left Randall and joined up with Alex. Archie joined later to complete the first classic Welsh band that now also included Lennie Hastings, Fred Hunt and Chris Staunton. The band's Condon tendencies, in a strongly evolving Banjo dominated European Trad scene, made them unpopular in the London Jazz clubs, but very popular in the rest of the country and in Scotland. The Bier Bar in Dusseldorf, Germany, was an important time for the band. Eight hours a night for two months led to a wider type of exploration of a repertoire. The popular classics of Gershwin and Porter were played every night. This was very popular with the audience, but led to a problem for Roy and Archie ... how do you play Dixieland ensemble clarinet and trombone around these beautiful songs? Gradually, playing them every night, listening to each other closely, Roy and Arch found a personal system of making them an integrated whole. It opened and widened their harmonic ears. Unlike the later 'World's Greatest Jazz Band' of Bob Haggart and Yank Lawson, it was completely improvised and probably the only band of its type in the world at this time. Roy remembers one occasion when the Welsh band was booked to appear at a student's venue in Bradford. When they arrived, they found that the Sandy Brown band had also been booked for the same day. Unusually, the double booking was resolved by both bands playing all together on the same stage! When Archie became ill and had to leave, the sound of the Alex Welsh band lost its individuality. Roy and Archie had greatly shaped the band's sound by their knowledge of Condon's music and persistent arguing against the others. Roy, now alone in this struggle had to give way and gradually the band lost its American sound and leaned closer to 'Banjo Trad', resulting in Roy leaving the band in 1965. From 1965 to 1978, Roy was based with his family in Zurich. During his 13 years on the continent, Roy toured with his own band and arranged and recorded for Gold Records under the name Roy King. His collaboration on a live T.V. series aired from Vienna throughout Western Europe, with the Austrian musician Fatty George proved very popular. In 1978, Roy returned with his family to London to rejoin Alex, remaining until Alex died in 1982. Roy now joined Harry Gold and his Pieces of Eight and resumed heavy touring, including East and West Germany, Holland, Belgium and Ireland. At this time, Roy also joined the five trombone ensemble 'Five A Slide', making records and T.V. spots. A great thrill for Roy was to be asked by Bob Wilbur to join his Benny Goodman and Duke Ellington orchestras, interpreting the original Lawrence Brown, Tricky Sam Nanton and Juan Tizol trombone solos, performing at the Nice and North Sea Jazz Festivals, and four great days at Oldham. At this time, Roy was approached by the Mayor of Eilat, Israel, to advise on establishing an Intenational Jazz Festival in Eilat. Roy's involvement in this venture led to the renowned Red Sea Jazz Festival of today. Soon after, Roy and his family moved to Tel Aviv, Israel, where he established the Israel Jazz Ensemble, was commissioned by Musica Nova (a breakdown group from the Israel Philarmonic Orchestra) to write a concerto, which premiered in the Tel Aviv Museum Concert Hall to great acclaim. 1. Entrance to the city. Special Arrangement: 'The Train and the River' (Guiffre). Bill Harris, Jack Teagarden, Tommy Dorsey, Brad Gowans, Milt Bernhart, Jack Jenny, Lawrence Brown and Ray Simms. Bix Beiderbecke, Lester Young, Duke Ellington, Artie Shaw, Dave Tough, Coleman Hawkins, Benny Goodman, Bobby Hackett and Art Tatum. Our beloved Roy was laid to rest yesterday. The funeral was very sad but at the same time his life was celebrated. People loved him here, he was always very generous and as we say here a real mensch. He was highly respected and if I may say even revered by many musicians, students and regular folks. The ceremony, which was held in the Israeli tradition, was very respectful and moving. Judi read to him an extract from Dickens, whom they both loved and shared. Merton Cahm (a jazz musician from Manchester who relocated to Israel in the 70s; he and Roy played together many times and became close friends) played "Danny Boy" and it was stunning. People were overcome with emotion. Roy's burial place is in a beautiful cemetery that belongs to Kibbutz Degania B. Roy loved the sea of Galilee (we call it Lake Kinerret because it's shaped like a violin, and in Hebrew a violin is a 'kinor') and he spent many enjoyable days there. His plot is in between two shady trees and it's very scenic and peaceful. If anyone would like to add memories or tributes to this page - please contact us. Jean Wilson tells us about a tribute on Radio Israel to trombonist Roy Crimmins who passed through the Departure Lounge in Septemnber 2014. The introduction to the programme (which starts with Ben Webster (?) That's All) and the commentary is not in English, but the piece about Roy, starting at 2.50 minutes in has tracks featuring Roy and part of the programme is in English. You can listen to it if you click here. Well worth listening to and there are some nice examples of Roy's trombone playing.